The "Fat Bird" mascot welcomes visitors to Nemacolin Woodlands Resort. Nestled in Pennsylvania’s Laurel Highlands about 70 miles southeast of Pittsburgh in Fayette County is the Nemacolin Woodlands Resort, a 2,000-acre playground offering an array of amenities to appeal to a wide range of travel tastes. This fall, I took advantage of the opportunity to spend some time at the popular resort. The extraordinary art displayed throughout the property, as well as other interesting features, inspired me to learn more about the destination's history, its founder, its impressive art collection and more. If you're considering visiting Nemacolin, I hope this article will provide insight on making the most of your time at this unique and special place. 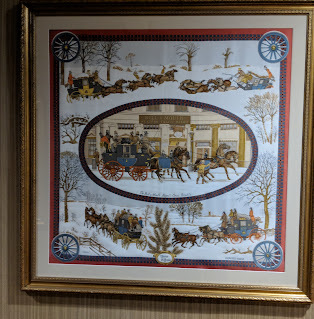 I learned that the resort takes its name from a Delaware Indian chief by the name of Nemacolin, who, in the mid-1700s, helped settlers blaze a trail westward along what is now Route 40. The bucolic area was once home to a private game resort, owned by Pittsburgh industrialist Willard Rockwell, who would invite associates for deer, bear and fox hunting, as well as fishing in the trout-stocked Beaver Creek. The businessman eventually added an airstrip, lodge and golf course to the property to accommodate an even wider range of guests. It wasn't until the late 1980s that the property changed hands when Rockwell’s son Kent, (who was operating an inn on the property at the time), suffered some financial setbacks. Nemacolin went up for auction and was purchased by 84 Lumber Founder Joseph Hardy III, who set the wheels in motion to upgrade it to a world-class destination. Today, Hardy’s daughter Maggie Hardy Magerko oversees operations at the AAA Four-Diamond Resort. My room at the Chateau Lafayette was beautiful, spacious and comfortable. A variety of room options are available at the resort. During my stay, I enjoyed a spacious and elegantly appointed room at the Chateau Lafayette. Inspired by the Ritz Paris, the Chateau Lafayette was designed as an homage to the grand hotels of Europe, featuring vaulted ceilings, crystal chandeliers and marble bathrooms. Additional accommodations created to cradle guests in the lap of luxury are at Nemacolin’s Falling Rock. The boutique hotel is the only Forbes Five Star, AAA Five Diamond property in Pennsylvania and includes 24-hour butler service. Guests can also stay in the original resort known as The Lodge, which resembles an English country inn and is celebrating its 50th anniversary this year. Nemacolin caters to the multi-generational travel trend by offering luxury vacation homes to larger groups. And for those who are loathe to leave their four-legged friends at home when they go on vacation, there is a select area of townhomes on the property where pets are welcome. Golf enthusiasts will be "in the zone" with Nemacolin's award-winning courses. For the seasoned golfers, there's Mystic Rock, which earns top honors from Golf Magazine and Golf Digest and ranks number one in Golfweek’s “Best Courses in Pennsylvania.” Designed by Pete Dye, Mystic Rock was featured on the PGA Tour and has challenged such golf legends as Tiger Woods, Phil Mickelson and Vijay Singh. Shepherd’s Rock, also located on the Nemacolin property, is another option. Rated number five in Golfweek’s “Best Courses in Pennsylvania,” it offers an outing that is both fun and challenging for golfers of all levels. Nemacolin offers a range of activities designed to get the blood pumping. The area is popular for biking, hiking, miniature golf and tennis. Guests interested in a little friendly competition can race each other on the 3,000-foot zipline known as the Fatbird Superflyer, or challenge themselves on a ropes course, scramble their way up to the top of a 50-foot, freestanding climbing wall, or hone their paintball skills in a makeshift town equipped with an array of targets. One activity that is fun and fascinating for all ages is the Safari Tour, which transports guests to the wildlife preserve where a chain-link fence is the only barrier between humans and animals. Lions, tigers and bears romp freely over the expanse of land, often responding to human voices and venturing towards the guests for an up-close-and personal visit. 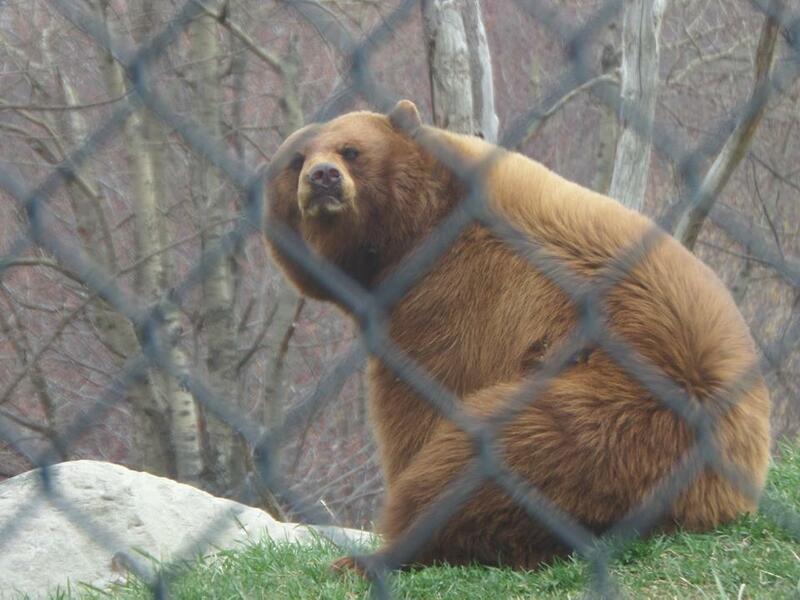 Animals that can be seen on the Safari tour. While I was visiting, a few intrepid members of our group opted to tackle 20 miles of rugged off-road terrain in a Jeep Rubicon, after a short lesson from a seasoned instructor. I chose, instead, to take part in something a little less adventurous. I'd share the landscape I painted in the art class conducted on site, but I'd rather you use your imagination to envision burnt scrub brush, because that's a pretty accurate description of how it turned out. Unlike Bob Ross, none of my artistic accidents are happy ones. 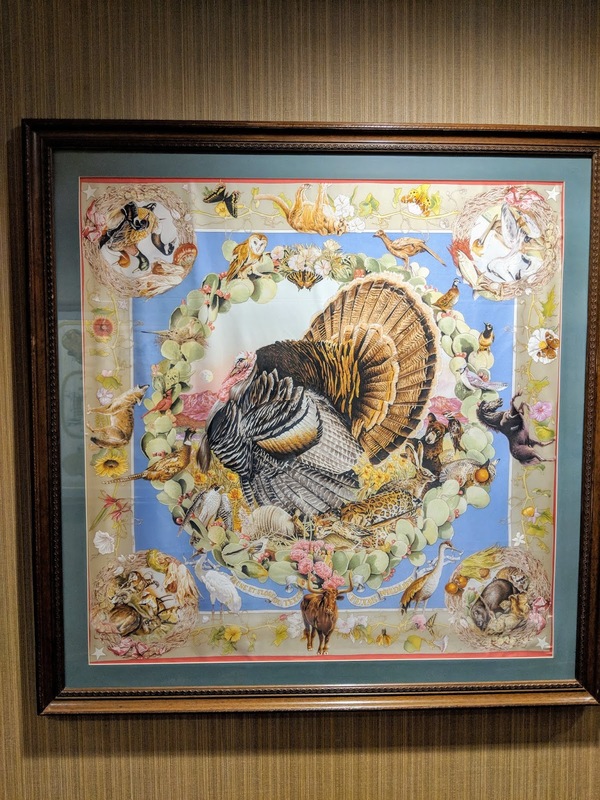 Additional activities, such as top-rated sport clay shooting and seasonal bird hunts, are available at the Nemacolin Field Club Complex, which spans 140 acres of woodlands and touts some of the finest fishing streams and creeks in the eastern United States. During the colder months, guests can tube, ski and snowboard on Nemacolin’s very own Mystic Mountain, which features six slopes ranging from beginner to expert. Indoor activities are available as well. For the younger set, there’s the three-foot-deep Kidz pool and the Hardy Girls Gymnasium complete with foam pit, balance beams, a trampoline and more. If that’s not enough, there’s also the Kidz Klub Arcade, which features a variety of arcade games to keep the little ones entertained for hours. Another favorite kids spot is P.J. 's for ice cream, pizza, milkshakes and more. Kid's especially enjoy P.J. 's for ice cream, milkshakes and pizza. Lautrec has earned a AAA-Five Diamond award and a Five-Star award from Forbes. 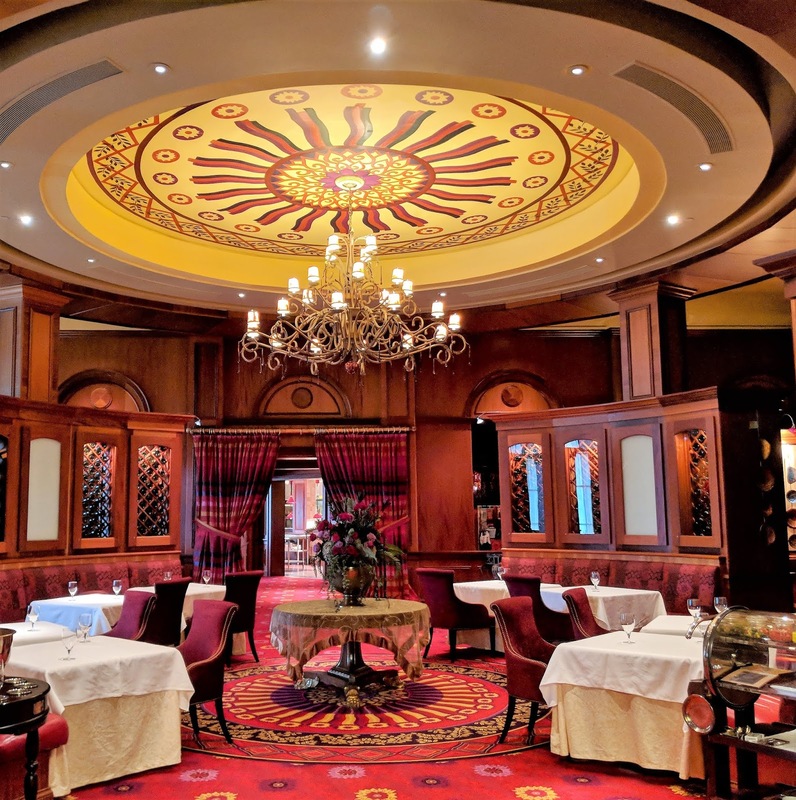 Among the dining options available at Nemacolin is Lautrec—a restaurant so excellent and well regarded that it received not only a AAA Five-Diamond award, but also a Five-Star award from Forbes. The European-influenced restaurant is one of only 30 in the world to hold both designations for more than a decade. Executive Chef Kristin Butterworth proves herself worthy of the distinction with each meal she prepares and guests walk away with an understanding of why Lautrec maintains its reputation as one of the finest restaurants in Pennsylvania. 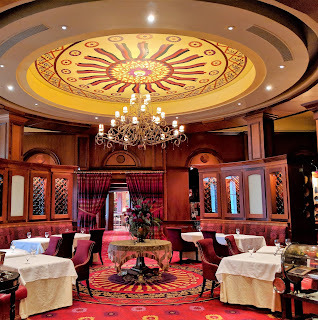 Outstanding food, white-glove service and a beautiful décor, (which includes six original Toulouse Lautrec lithographs), all add up to a one-of-a-kind experience that is far beyond the ordinary. Shopping opportunities are plentiful at Nemacolin, with 17 stores and boutiques offering everything from art and apparel, to jewelry, cigars and golf clubs. My favorite is the Chateau Signature Shoppe located in the Chateau Lafayette. There you’ll find a selection of candles, gifts and apparel featuring designers like Ted Baker, John Varvators, Peter Millar and my favorite Samuel Dong, whose joyful designs seem to elicit a smile from everyone I encounter. I can never resist his fashions and ended up splurging on a spring coat that appeared to be lifted directly from a watercolor painting, decorated in happy hues of chartreuse, purples, pinks, greens and blues. If you are feeling a little stressed, The Woodlands Spa is designed to help you unwind with an array of services from facials, to body scrubs, manicures and pedicures. Unique signature services include a Water Path treatment designed to stimulate circulation using alternating water temperatures along a pebbled pathway to improve blood and lymph flow, the Shirodhara, which is designed to increase blood circulation and improve sleep, and the Dream Catcher, which is a blend of Native American and Hawaiian Lomi Lomi healing techniques. If you’re an art lover, you’ll feel as though your head is on a swivel as you take in the staggering display of art on display both inside and out. You’ll see works by renowned artists ranging from Alexander Calder, to Frederic Remington, Louis Comfort Tiffany, Henri de Toulouse-Lautrec, J.J. Audubon and more. "Heart Grenade" is just one of many art works at Nemacolin. One work that appears in numerous places on the property is “Fat Bird,” a bronze created by Barney Boller. “Fat Bird” was personally selected by Maggie, who oversees operation. “The Fat Bird is fun and whimsical, much like the expectations of our guests,” she said. "A Rare Bird Indeed" Barney Boller. When I saw something that piqued my interest during the day, I took the time to do a little research in my room later that evening. 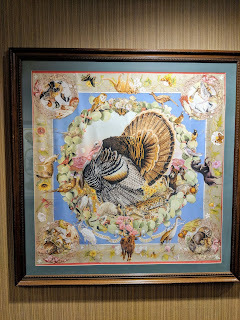 For example, I learned about the incredible amount of work it takes to make each one of the framed Hermes scarves I passed while walking through a long hallway to breakfast each day. This information gave me a renewed appreciation for the iconic Hermes brand. Fun fact: Hermes ensures the finest quality of silk by providing silkworms with a fortified diet of mulberries. 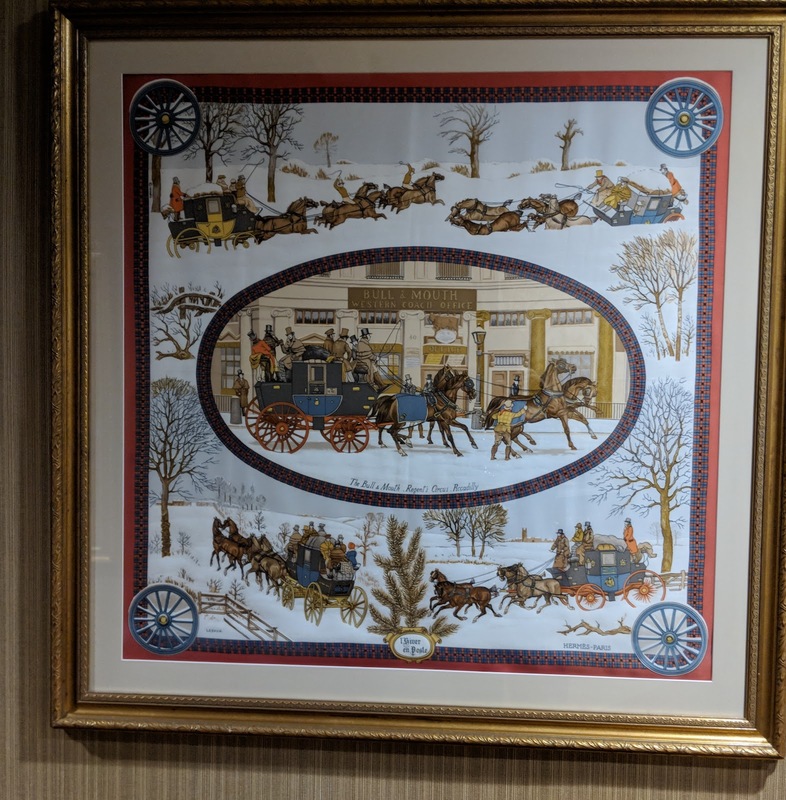 Hermes silk scarves festoon the walls in a hallway at Nemacolin. Guests who fail to explore the outside of the resort may miss quite a bit of art, so be sure to jump in the car and drive around the grounds. Below are a few examples of the many pieces located around the property. A Buddha sits outside a chapel built for reflection. 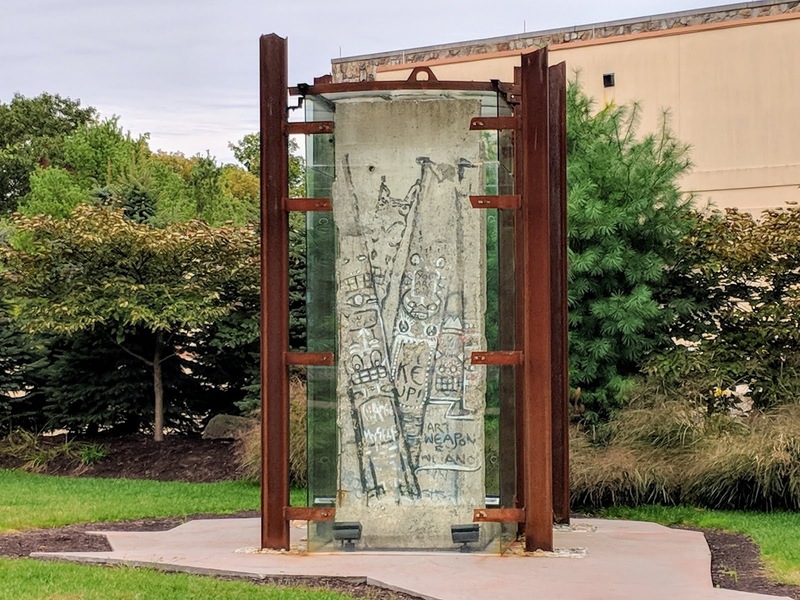 Another item of note is this section of the Berlin Wall located on Lafayette Drive, which was donated by Lord Peter Palumbo to inspire future generations to diligently safeguard liberty. 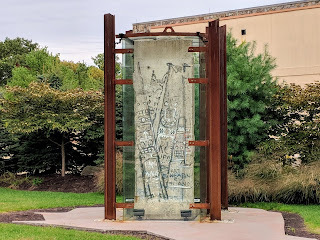 I hope these few highlights are useful should you decide to venture out to Farmington, Pennsylvania to experience this interesting destination.